Hello, welcome to week 4 of Scrub league! Iron - Gold - Silver challenge = Get the Iron rune, Silver rune and golden rune of Zot in that order and win. Post qualifying morgues and I'll give out points accordingly. Last edited by Vajrapani on Thursday, 21st June 2018, 17:33, edited 5 times in total. This seems like it'd be easier for a stabby Spriggan than a Mi/HO/Gr. Lost the first ghoul on D:12. Ghoul seems like a good choice. I'm really ashamed of this one - I could have easily lived if I had not used Draw Out Power in my final encounter against Aizul. Since, y'know, that would have allowed me to use Apocalypse and most probably just win the fight. Or even just not fighting in front of a flayed ghost. That being said, I think I've had enough of this challenge myself. I'm not good at challenges that need me to be patient and optimize every step. 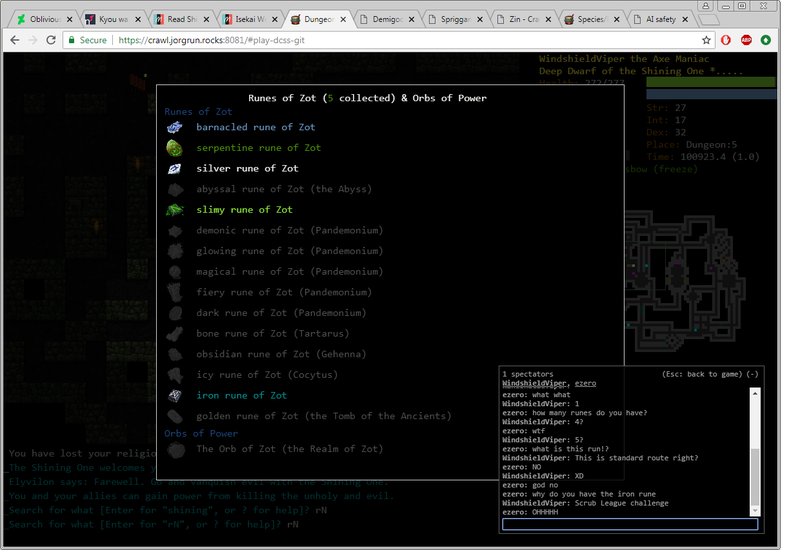 Dungeon Crawl Stone Soup version 0.22-a0-425-g89d60a1 (tiles) character file. Began as a Minotaur Monk on June 14, 2018. ... on level 3 of the Depths. The game lasted 01:17:35 (35767 turns). You were on level 3 of the Depths. You visited 4 branches of the dungeon, and saw 20 of its levels. You collected 1706 gold pieces. You spent 583 gold pieces at shops. Blade Hands Tmut #......... 100% 5 ######. Borgnjor's Vile Clutch Necr/Erth #......... 100% 5 ######. You are hated by all. Your cowardice makes you less effective in combat with threatening monsters. You cannot study or cast Hexes magic. You redirect the flayed ghost's attack! You slash Aizul! You burn Aizul. Aizul is stunned by your will and fails to attack. Aizul coils herself and waves her upper body at you. The bolt of poison hits you! Your shield and fire dragon scales prevent you from hitting Aizul. You could see Aizul and a flayed ghost (blind). 0 | D:1 | Marenglen the Minotaur Monk began the quest for the Orb. 1120 | D:2 | Found a snail-covered altar of Cheibriados. 1120 | D:2 | Found a glowing silver altar of Zin. 1125 | D:2 | Found a stormy altar of Qazlal. 1127 | D:2 | Found a glowing golden altar of the Shining One. 1129 | D:2 | Found a white marble altar of Elyvilon. 1408 | D:2 | Found an iron altar of Okawaru. 1408 | D:2 | Found a bloodstained altar of Trog. 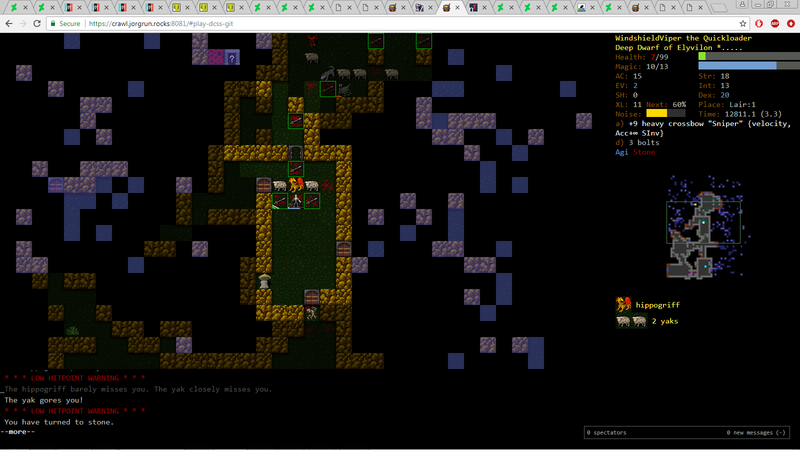 1593 | D:3 | Found a radiant altar of Vehumet. 3258 | D:4 | Found Hiariur's Food Emporium. 3281 | D:4 | Found Eseiss's Distillery. 3370 | D:4 | Found a shattered altar of Ashenzari. 3605 | D:5 | Found a glowing drain. 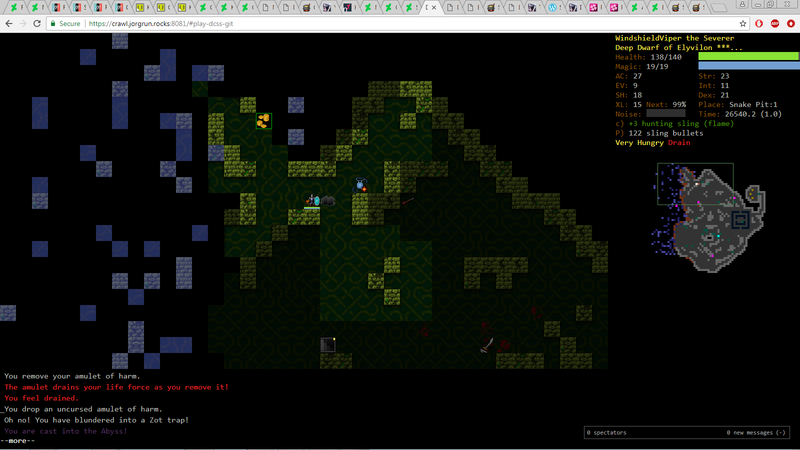 4159 | D:5 | Found a shimmering altar of Xom. 6530 | D:7 | Found a staircase to the Ecumenical Temple. 6809 | D:8 | Found a blossoming altar of Fedhas. 7849 | D:9 | Found a hide-covered altar of Uskayaw. 8165 | D:9 | Found a staircase to the Lair. 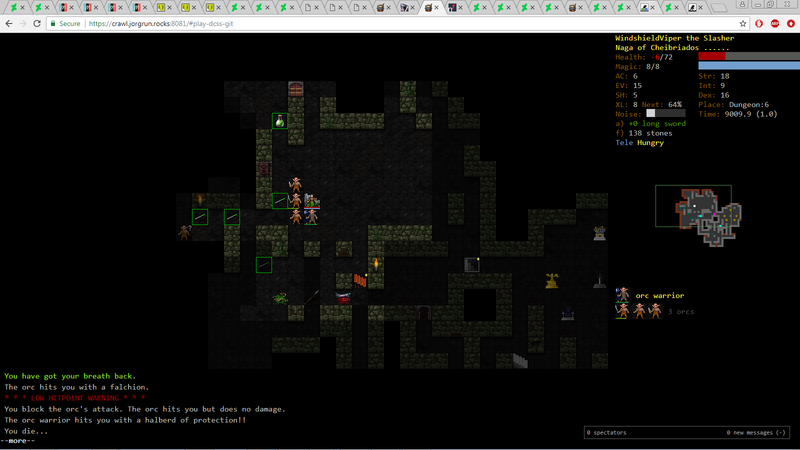 9766 | D:10 | Found a staircase to the Orcish Mines. 13192 | D:13 | Found a gate to the Vaults. 22583 | D:15 | Found a staircase to the Depths. 24738 | Depths:1 | Found Hadaf's Armour Emporium. 26804 | Depths:1 | Found a gateway to Hell. 29859 | Depths:2 | Found a one-way gate leading to the halls of Pandemonium. 30414 | Depths:2 | Found Ohofrut's Pet Rocks. 30972 | Depths:2 | Found a gateway to a ziggurat. 34815 | Depths:3 | Found a shimmering altar of Xom. 108. [dam=41] ScrubMan the Slayer (L27 MuFi of Gozag), blasted by a revenant (dispel undead) on Tomb:2 (tomb_2) on 2018-06-16 01:14:59, with 607441 points after 90940 turns and 3:04:30. I died by underestimating a revenant in Tomb, who in retrospect I could have shut down by reading silence. This run was quite challenging despite acquiring a +8 eveningstar of protection and the Orange CPA before Depths. Pro tip: if you have the patience, scumming for XP (or in my case enough gold for bribe branch) by waiting in Dis on an exit is extremely safe. Oops. That was embarrassing. Grinder forced me back downstairs and I should've drunk a potion of might. I'm thinking I should be a gargoyle axe/xbow hybrid of Ru... Eh. Time to learn TSO. Or maybe I could scum hell with Jivya..? A dwarf of Ely-->TSO? Learned the hard way not to walk towards alarm trap sounds, and another reminder that petrification halves attack speed. In my defence, I did have max health and popped haste, blink, agility, and heal wounds preemptively. But my haste wore off fast and I miscounted how long it takes to shoot a heavy bow while petrifying. Or as Reeces keeps telling me: Don't rush for timed portals. Last edited by FakerFangirl on Saturday, 23rd June 2018, 05:22, edited 1 time in total. Iron+silver+glod, then remaining hell runes. Got the abyss rune near the end of the game because I was tired of being banished, but only after I got the initial 3 runes. Definitely not my 1st attempt, and took more than 8 hours. Vajrapani wrote: Hello, welcome to week 4 of Scrub league! Missed all deadlines and forgot the Orc/Lair conduct - but I got my first iron rune ever Clearing vaults at XL27 feels like a MiBe run! Had a pretty funny reaction!